• both whereby some employees would have a FuelKey while others would have a code. Management would determine pre-set fuel grade and gallon restrictions unique to each employee’s FuelKey or ID#. Supports over 3,000-users. With the code (“keyless”) option, management issues the employee a FuelKey ID# (up to 8-numbers) and PIN (4-numbers). Employee uses keypad to enter data prompted at the display. The KeyPad Controller display can prompt for additional data to initiate fueling: odometer, VIN, alpha-numeric equipment ID, job number, department to be charged, etc. Data retrieval via data keys for stand-alone units or via remotely using radios or over IP via CAT5—call for information. DataPak FLOWrangler KeyPad controllers manage up to 4-pumps and provides vehicle ID, engine hours, time, date, gallons & ID of the employee. 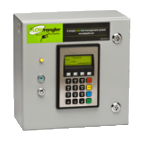 For businesses that are serious about their data, the FLOWrangler 2-Touch controller is the choice. •	The ‘2-touch’ controller requires the driver to touch the probe on the DataLogger on the equipment to be fueled with his FuelKey to ‘load’ or transfer the equipment ID & engine hours into his FuelKey. •	The ‘loaded’ FuelKey is placed on probe of the FLOWrangler Controller probe to initiate fueling. •	Generates a csv file that is used to create a fuel report with Excel or other fleet maintenance programs. •	Will control up to four pumps. Management would determine pre-set fuel grade and gallon restrictions unique to each employee’s FuelKey. Supports over 3,000-users. It’s a “touch, touch & go” feature. It’s easy. It’s fast. And it is very secure.